Use boneless chicken breast fresh from the package or your butcher. Rinse in cold water and place in a glass baking dish. Turn your oven on to 350 degrees to preheat while you finish getting the chicken ready to cook. 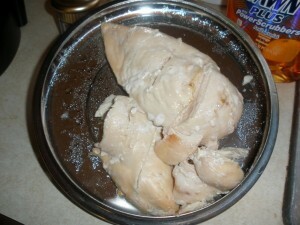 Sprinkle the chichen breast with the dry mix of ranch dressing. Do not mix the dressing with anything else. Add light salt and pepper to taste. Add cut and peeled carrots around the chicken. This will be a pretty dish when you set it on the table. Add 1/4 cup of water and cover the dish with foil or a glass lid. Cook in preheated oven for about forty-five minutes. Check to make sure the chicken is cooked all the way through and there is not raw meat. Remove from oven and serve with white rice as the side. Enjoy!